This program displays a three-dimensional model of the 3`810 stars lying within about 80 light-years (25 parsecs) of the Sun. You can move through it using the arrow-keys and Z/X for in and out of the screen. 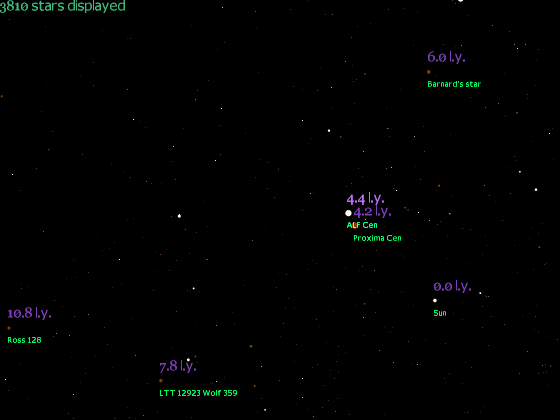 The distances shown in purple are distances from the Sun and the displayed luminousities of the stars are proportional to their real magnitude at that point in space. Brown disks are shown surrounding very faint stars (such as red dwarfs) that are near to the observer, as these would not otherwise be noticable on the plot. The brown disks would be 1 trillion km (0.106 light-years) across in real space: for comparison, our Solar System has a diameter 68 times smaller than this. Common constellations are incomplete or not visible on this plot because they contain very bright stars that are more than 80 light-years away. 3D Star Map (.7z file, 185KB; Zip file, 238KB).